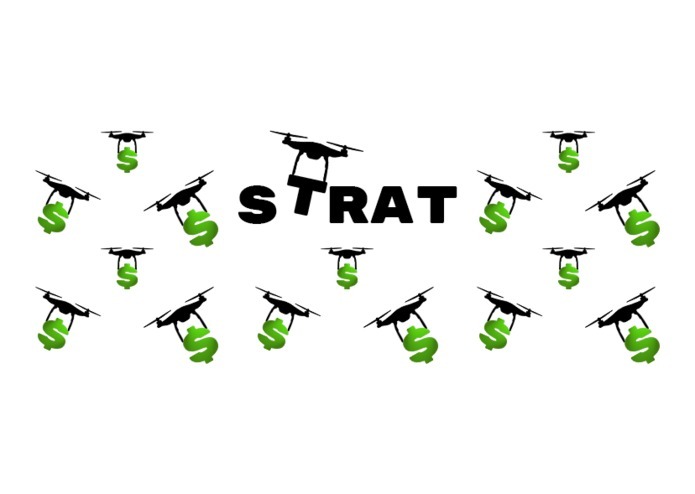 STRAT brings financial data to you. On demand. With ROBOTS. SzechuanTech brings professional risk management from BlackRock to individual investors looking to diversify investment portfolios and learn more about investments. Through an easy-to-use chatbot, users can get suggestions to diversify and grow their portfolio, getting quick access to broken-down information about any stock. Even in 2017, managing financial securities involves either long and tedious meetings with a financial advisor, cold and impersonal interactions with an algorithm, or a mix of both. We felt that there was an opening in the chat bot marketplace for providing personalized financial data and recommendations to every day users. 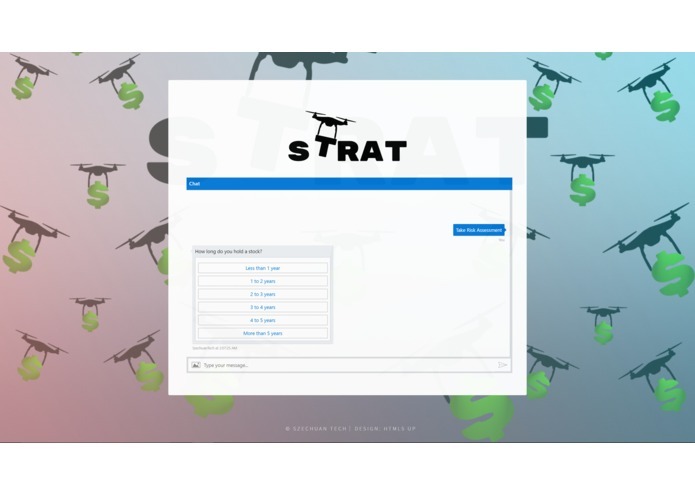 STRAT acts the user a series of personality-based questions to assess his or her risk profile, using the answers to calculate a number between zero (most risk-averse) and one (least risk-averse). These answers define the profile of the user for interacting with STRAT. Then, on prompt from the user, the bot can either (1) provide information about a specific financial security (e.g. "tell me about apple") or (2) make recommendations that fit the calculated risk profile of the user (e.g. "suggest a stock"). 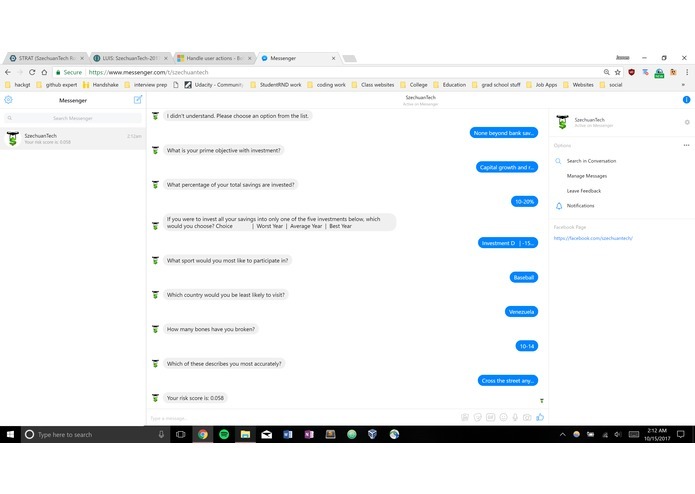 The chat bot was built using the NodeJS implementation of the Microsoft Bot Framework. The bot runs on an Microsoft Azure instance and can be plugged into several different messaging services, such as Slack, Messenger, and Skype (or, more simply, on the Microsoft Bot Emulator). The bot invokes Python scripts on the back-end that fetch data from Blackrock's Aladdin REST API to be used to provide information about financial securities for the users and data for calculations about the risk of each security (so as to make the best recommendation to the user). Definitions of the terms on the Aladdin API were few and far between, so we had to do a fair bit of research to determine what metrics were best suited for our purposes. The data from Aladdin, too, was not perfectly matched with our intentions, so we had to do some hacking to get the data and metrics we wanted without making a bajillion HTTP requests. Additionally, our group was much more comfortable to fetch data from Aladdin in Python instead of Node, so we had to use some creative workarounds to call the scripts we wrote from the app.js file. This inadvertently led to the Python integration (and thus the entire bot) failing much more than we would have liked. Finally, for the longest time we were running our bot on a purely free instance of Azure, which murdered the performance and responsiveness of our initial protoype. It was only until we set up our bot, with the help of a Microsoft employee, on an instance with a pass for credit that it became functional. This was the first real hackathon for most of the group, so to churn out a project we all found interesting and loved building is something we can tell our parents about. We also built something that we felt filled a need and helped solve a common issue (or at least make valuable steps to do so). Some of us also found that we were able to thrive mentally despite very little (see: none) sleep. Documentation of a framework or API is nearly as crucial to their effectiveness as how well the technology is actually implemented. A corollary to that, it turns out, is that the more the implementation of a technology deviates from your specific use-case, the more creative you have to get when incorporating said technology into the functionality of your project. It would be cool to integrate the bot with the (unofficial) Robinhood API to allow the user to buy stocks on their Robinhood account after receiving a certain recommendation or quote. The bot could also be much more versatile if it took into account factors other than risk and volatility when making a recommendation (and also ask similar personality questions for those other factors). The next steps for this project would be to fetch investment data from services like Fidelity, Mint, or Robinhood and assess the risk of a user's portfolio as we make suggestions, in order to best diversity the user's portfolio. I developed the Node.js bot using the Microsoft bot framework and trained the chatbot using LUIS. It was my first time using Node.js, but will not be the last. 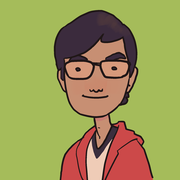 LUIS is very exciting because of how easy it is in train and, yet, its results are remarkable. I spent my HackGT managing the relationship between the Microsoft Azure bot and the BlackRock API using Python. Using a combo of BlackRock and Yahoo Finance, users can use Natural Language to talk about their stocks with a bot, without having to be a stickler about format. I did a bulk of the creation of the back end data parser. I was the Product Manager at times, helping our team determine features and consolidating our design and implementation to finishing in time. I also set up azure, helped train the chatbot, and helped develop the python and node.js code. For most of us, this was our first time using node.js and azure!